Remember Orange Roughy? Doesn’t it remind you of the 80’s? Growing up, there was a period of time that we must have had it once a week and I remember wondering about its funny name. Living in the midwest, our ocean fish came frozen and, frankly, “fish night” wasn’t my favorite night of the week. In high school, I became a vegetarian and didn’t think about fish for several years until I moved to Portland, Oregon in 1994. Suddenly, a whole new world of fresh seafood became an option and my vegetarian convictions were shaken. Back then, it was all about Salmon and Halibut. Swordfish and Chilean Sea Bass were on every menu, too. But no Orange Roughy. I just figured it wasn’t cool enough. But I was wrong. Last month, Mark Bittman wrote an excellent New York Times Editorial calling attention to the acidification of our oceans and the deleterious effect on fish, and ultimately on our ecosystem. He followed it up with another column discussing the recent study by the International Union for the Conservation of Nature that says over 40 species of fish will disappear in the Mediterranean in the next few years. We have already seen the effects of overfishing at the market with species familiar to us a few years ago now conspicuously absent. Cod and Chilean Sea Bass are said to be making a “comeback”, but Bluefin Tuna and Atlantic Salmon may never return to their once bountiful numbers. All of this can make choosing which fish to eat a somewhat stressful experience. While there may be ethical issues with the raising and processing of meat and poultry, we are not at risk of running out of them. But fish? That is a whole other story. 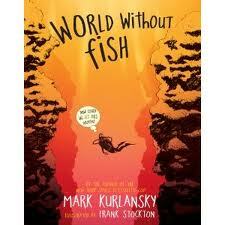 One that is beautifully written by Mark Kurlansky in his new book, World Without Fish. A graphic novel written for ages 9 and up, it covers the history of the fishing industry and explains how we got to where we are now – with our oceans acidifying and some of our fish stocks on the verge of extinction. A fisherman himself, it is clear he has a deep respect and understanding of the ocean and those who fish for a living. Not to give away the ending, but the story is a grim one. There is a whole chapter devoted to the sad fate of the Orange Roughy (turns out this fish – which by the way is actually red – can live up to 150 years and doesn’t even produce offspring until the age of 20). The intensive fishing in the 70’s and 80’s killed off most of the Orange Roughy before they even reached the age of reproduction, making them one of the most threatened species of fish within decades of their discovery by humans. By chapter five, you might decide never to eat fish again, but Mr. Kurlansky makes a compelling argument about why we cannot simply stop consuming fish to solve this problem. Instead, he gives plenty of information about how to get involved both politically and as a consumer. By choosing responsibly caught wild fish – and paying more for it – you are supporting the fisherman who are practicing their trade in a sustainable way. But how do you know what fish to buy? There are a few environmental organizations that are in the business of both supporting sustainable fishing practices and giving consumers the tools to help them choose well. One is the Monterey Bay Aquarium. Their Seafood Watch Program is probably the best known and they publish their guides by region. They even have a guide devoted to sushi. You can either download a PDF their pocket guide here: (MBA_SeafoodWatch_NortheastGuide-1) or get the app to your mobile phone. Keep it with your Clean 15 guide and going to the market will be a breeze. The Marine Stewardship Council is an organization that developed out of a partnership between the World Wildlife Fund and Unilever, an international seafood retailer. Their mission is to make the idea of sustainable fishing marketable by evaluating fishing operations and assigning labels to seafood products at the consumer level. You have probably seen their logo at restaurants and grocery stores indicating that a particular fish has passed their rigorous environmental standards. At the end of the day, Mr. Kurlansky points out that these guides, however helpful, cannot be completely accurate. They label some fish as verboten that are, in fact, being fished sustainably in some places. The only way to really know what you are getting is to choose a reputable fish monger, get to know him or her and start asking questions. World without Fish empowers you to do this. Buy it for your favorite 9 year old and read it with them. You won’t be sorry. In the meantime, I’m looking for recipes for sardines. Any ideas? This entry was posted on May 18, 2011, 7:19 am and is filed under helpful hints, kitchen. You can follow any responses to this entry through RSS 2.0. You can leave a response, or trackback from your own site. I love this post so much! Thank you for the great reading suggestion! I also love sardines. One of my favorite too-lazy-to-cook meals is linguine or spaghetti with sardines. I cook and drain the pasta, then mix in canned sardines and as much of the olive oil they come packed in as I like, coating the pasta with the olive oil and breaking up the fish with a fork. I finish with lots of lemon juice, black pepper, and some parmesan cheese, plus parsley if I have it and it is absolutely delicious comfort food! Thanks Karyn – what a fabulous sardine idea. I may even make it tonight. Hope you’re feeling better!